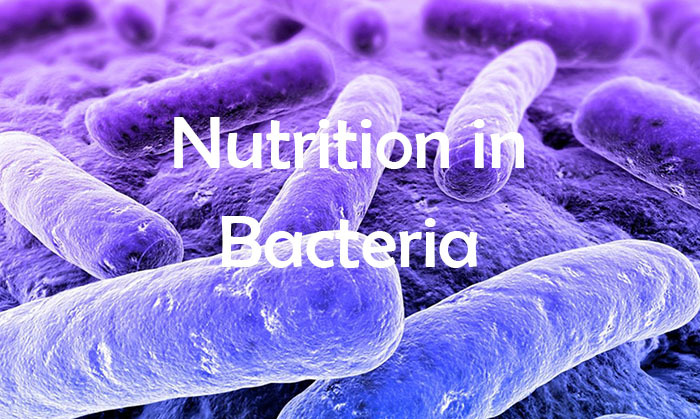 The bacteria can be classified into two nutritional categories on the basis of their nutritional requirements: the autotrophic and heterotrophic bacteria. The bacteria that are able to synthesize organic compounds necessary for their survival from simple inorganic substances are called autotrophic bacteria. They obtain carbon from inorganic compounds, mostly from carbon dioxide. The autotrophic bacteria are further classified into: photoautotrophs and chemoautotrophs. The bacteria in which the energy source is light are called photoautotrophs. These bacteria possess chlorophyll; therefore, these are able to manufacture their own food. These are also called photosynthetic bacteria. The bacterial-chlorophyll is similar in structure to the chlorophyll found in plant cells, however it is not contained in the chloroplasts. It is dispersed throughout the cytoplasm of the bacteria. 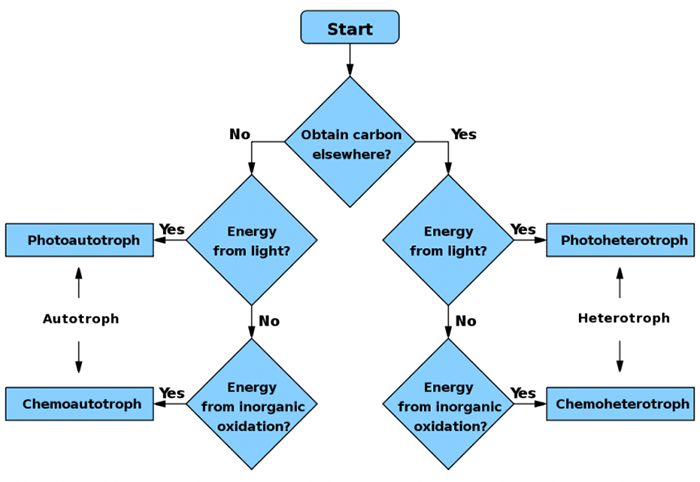 Photosynthetic bacteria use sunlight as source of energy. The hydrogen source is H2S (hydrogen sulphide) instead of water in these bacteria, and Sulphur is released during the process. Purple Sulphur Bacteria: The bacteria which use Sulphur compounds as a source of electrons and protons, for example Chromatiumokenii. Green Sulphur Bacteria: These bacteria use H2S as a source of electrons and protons, for example Chlorobium and Chlorobacterium. Purple Non-Sulphur Bacteria: These bacteria use organic compounds as a source of electrons and protons, for example Rhodospirullumrubrum which use propyl alcohol. The bacteria which derive energy from oxidation of inorganic chemical substances during respiration are called chemoautotrophs. These bacteria play important roles in the biosphere, principally in maintaining soil fertility through their activities in the nitrogen cycle. Iron Bacteria: These bacteria are commonly present in iron-rich water. These bacteria oxidize ferrous compounds into ferric compounds and obtain energy. Common examples are Leptothrix, Cladothrix and Ferrobacillus. Sulphur Bacteria: These bacteria are found in hot springs containing hydrogen sulphide. These oxidize metallic sulphide to Sulphur to obtain energy. The common examples are Beggiatoa and Thiothrix. Hydrogen Bacteria: These bacteria grow in organic media containing hydrogen, carbon dioxide and oxygen and can oxidize hydrogen with the liberation of energy. These include Bacillus panctotrophus. Methane Bacteria: T s bacteria oxidize methane to carbon dioxide. Methane is the source of both carbon as well as energy to these bacteria. For example, Methanosomonas. The bacteria that obtain their energy from organic compounds made by other organisms are called heterotrophic bacteria. These bacteria are unable to prepare their food and they get their food from other sources. The bacteria obtain their food from dead and decaying matter, for example humus. These bacteria are also called decomposers. These bacteria have their own enzyme system. They secrete enzymes which digest complex organic compounds into simpler substances. These substances are absorbed by the bacteria and used as source of energy. These bacteria are heterotrophic but lack their own enzyme system, therefore these cannot synthesize food from simple organic substances. They depend upon enzymes of other living organisms (hosts) to synthesize food for their growth. Many parasitic bacteria cause diseases. These bacteria are called pathogens or virulent. for example, Pneumococcus causing pneumonia. There are certain bacteria, for example Rhizobium radicicola, which form symbiotic association with roots of leguminous plants. They form nodules, fix atmospheric nitrogen, and supply nitrogenous compounds to the plants and get food in turn from plants.